Fleming Rutledge, having spent 22 years in parish ministry, now has an international preaching and teaching vocation. Her most recent book, God Spoke to Abraham: Preaching from the Old Testament, has received praise from many leading Old Testament scholars as well as preachers. Her previous books have met with wide acclaim across denominational lines and national borders. She is also author of The Battle for Middle-earth: Tolkien's Divine Design in The Lord of the Rings. 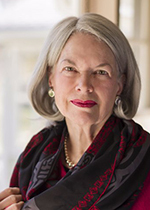 Mrs. Rutledge served as interim rector of St. John's, Salisbury, Connecticut (1996-7), and has twice been a resident Fellow at the Center of Theological Inquiry in Princeton. During the 2008 fall term, she was resident at Wycliffe College in the University of Toronto School of Theology, where she taught preaching. Most recently, she was a Visiting Scholar at the American Academy in Rome (April 2010). Mrs. Rutledge is widely recognized in the United States, in Canada, and in the UK not only as a preacher and lecturer, but also as one who teaches other preachers. Her particular expertise is the intersection of Biblical theology with contemporary culture, current events and politics, literature, music and art. She has often been invited to preach in prominent pulpits such as the Washington National Cathedral, the Duke University Chapel, Trinity Church in Boston, and the Harvard Memorial Chapel. Ordained to the diaconate in 1975, Mrs. Rutledge was one of the first women to be ordained to the priesthood of the Episcopal Church (January 1977). She matriculated at General Theological Seminary and received her Master of Divinity degree from Union Theological Seminary in New York in 1975. For fourteen years Mrs. Rutledge was assistant and then Senior Associate at Grace Church in New York City, a parish celebrated at that time for its youthful congregation and evangelistic preaching. She was actively involved in the renewal there. Her previous position was at Christ's Church, Rye, New York, where she was known for her creation and leadership of an extensive Christian program for high-school youth. About The Parchman Endowed Lectures bring world-renowned theologians to the Baylor campus and enable George W. Truett Theological Seminary to make a significant contribution to the realm of theological dialogue and the life of the church. All events are free and open to the public and will be held in the Paul W. Powell Chapel at Baylor University's George W. Truett Theological Seminary. Media You can watch or listen to our previous guests at the Parchman Lectures Media Library.